These unique prints are from the first edition of the work by W. F. Kirby, assistant in the Zoological Department of the British Museum. 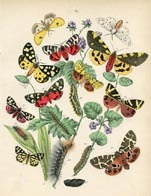 Each print shows a grouping of butterflies or moths around a bouquet of flowers or flowering plants. 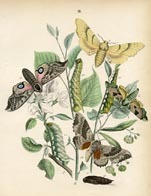 This work was from Cassell's, the respected British publisher of natural history books. 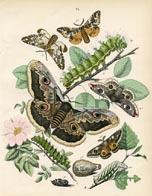 As Kirby states in the Preface "The present work is designed to provide entomologists and tourists with a comprehensive illustrated guide to the study of European Macro-Lepidoptera."